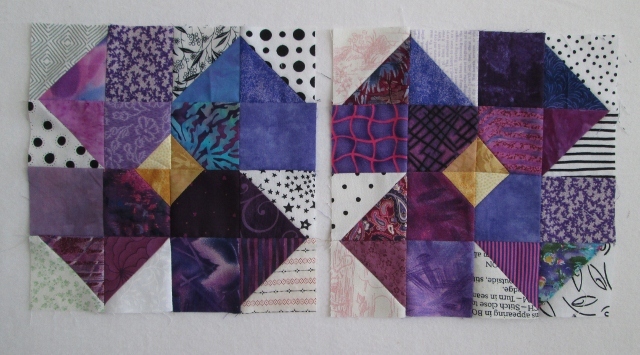 I got two pansy blocks done. I knew I could make a better pansy block then the sad one from last week. I had a comment from Paddilous who sent me this Pansy PDF link. I did not have many 4 1/2 squares needed but I did have the 2 1/2" square and triangles that I could use. So yes, I changed it a bit. I am happy with the flowers now. I have added today's post to Soscrappy's Scrap Saturday and I signed up for Friday Night Sew In with Heidi. I did get some of the blocks done Friday. I sew most Friday nights. I got some Spools done this month. This block is a Bonnie Hunter Leaders and Enders Challenge. I have about 12 more cut out to do and to finish up in the last few days of February. What colour will be next for March? I am going to take a guess at Red. Why Red, because Angela has started making Red Dear Jane blocks. Maybe I will be Wrong and it will be Green for St Patrick's Days. If you want to join in the fun check out the RSC13. I got 32 purple butterflies done this week. 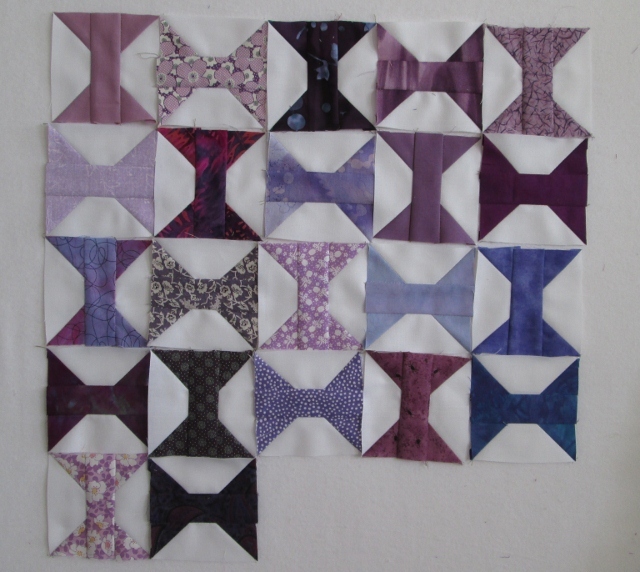 The Pattern for the Butterflies is at Bee In My Bonnet Row along Row 2. Here a just two 16 patches. I have been doing 9 of each colours so I am not done yet. Below is the 2" squares I still have left to use. This weekend is the Edmonton Orchid Show. I went Friday afternoon and bought two new plants and some new potting bark. 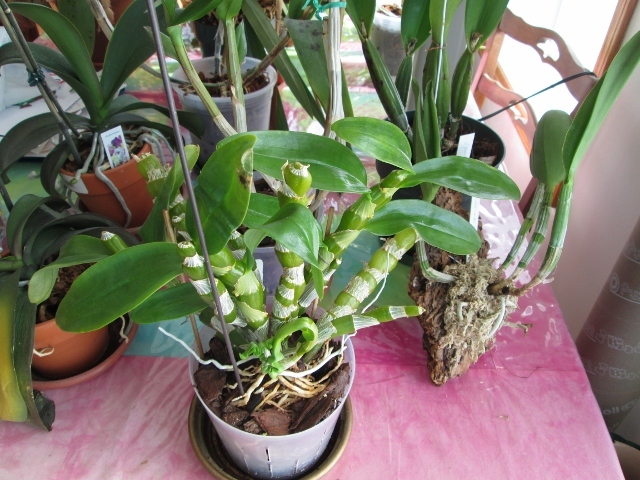 I replanted about 5 of my older orchids when I got home. The two new plants are not flowering but maybe next year. One plant is on the far right and is attached to bark and not in a pot. I need to find a spot to hang that one. P.S. the new pansy blocks are wonderful! Great projects! I hope you're right about the red...I have tons of red scraps between QOVs and Christmas! Do you think there's any chance we could get Angela to spill the beans early this month (since she didn't exactly announce the color purple until after she was posting her blocks? And it is the last Saturday!?!? Come on Angela...tell us...LOL! I'm guess next month's color will be red, too. 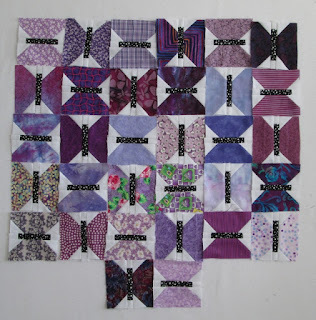 Love all your purple blocks - I'm always amazed by what you accomplish each week! You have such beautiful blocks here! Especially love the pansies and the bowties. So pretty! 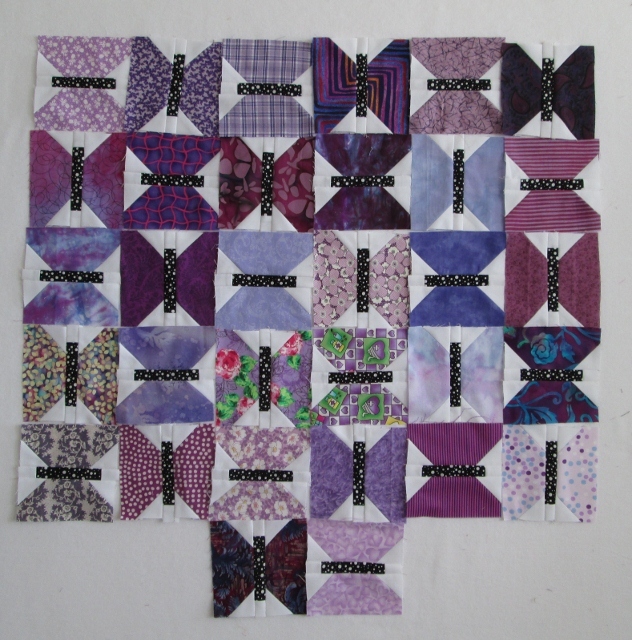 I love the pansy blocks, I may have to try some of those. They have always one of my favourite flowers and Uncle Dave's favorite. Visiting from FNSI - love all the purple blocks. Might be a bit bias though as purple is my favorite color. You and I must be separated twins! I have orchids, too. Some have bloomed, but most haven't. Love your pansies, too. Oh yes! Your pansy blocks positively bloom with gorgeousness!!! 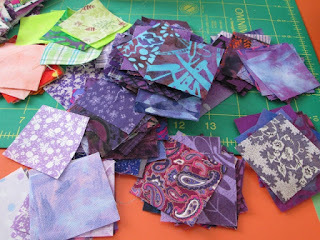 Love the way they move :*) Great job using up those purple scraps - lots of variety and fun projects! Those butterflies are so cute! 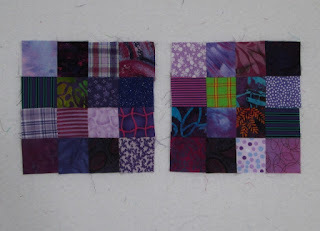 So many lovely purple blocks. Wow. Love all of them!